This should get a lot of play in the next few days…..but this is supposedly a reaction to yet another Venoy Overton foul from yesterday’s UW loss to Pur-Dont. Oh, poor Governor. State deficit got you down Christine? And I know she’s a Husky and all, but still, nice to see the Gov support her local NCAA teams in postseason play. 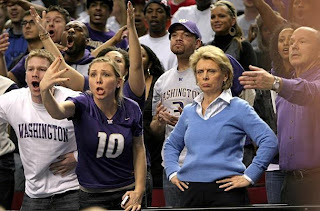 Notice the neutralish-looking purple/light blue sweater which says UW, but at least hints at a possibility of Gonzaga? Quick, anyone know if she went to Denver to see our Cougs last year in the first round??….No?? And that’s her daughter on the left. I’m not exactly sure what she is trying to do. How sad that the refs decided the game by not actually allowing the good, clean Venoy to play his game. You know, the Venoy who grabs, trips, and tries to start fights when things aren’t going so well (see: ASU loss, Pac-10 tourney). Also a little ironic to see the Governor sitting in the palatial Rose Garden. You know, the big-time arena in the city in what is supposed to the “little brother” to big, bad Seattle? The city that has figured out how to keep and support their NBA club? The city where they have an anchor tenant producing 41 nights a year of 17,000 money-spending basketball fans? Not such a bad thing is it? Maybe she’ll retreat back to Oly with her tail between her legs and yell down the hall “hey Chopp, you know, maybe we should make sure the Key thing gets done?” Nah. 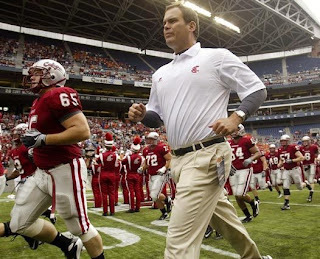 Moving on, Cougfan had a good article about where the high school talent is coming from these days. Namely, NOT Washington. Sure, we’re excited about the kids who are coming to WSU next year. But the state produced just 19 D-1 football players who received full scholarships in this year’s signing class, just 13 of them headed for BCS schools. But Texas and Florida combined? Try an amazing 698! That’s right, SIX HUNDRED AND NINETY EIGHT players from Texas and Florida signed to play D-1 football. That is unbelievable. But as Cougfan points out, it’s not just WA where the numbers are lacking. Oregon produced just 10 D-1 players, and Idaho had only eight. California helped pick up the west coast slack with 220 D-1 players, 114 of which signed with BCS schools. I guess the reasons are many. Population density being a big one. As of July 2007, over 55% of the country lives in the eastern part of the United States, or east of the Mississippi. And the warm-weather states like Texas, Cali, Florida, they just keep producing big-time talent. Kind of makes you wonder if the idea of “winning the state of Washington” in recruiting battles is really all that important after all? I mean sure, there are some key players that come out of this state every year who go on to do great things on the football field. And it makes for good headlines in the local rags when your school gets a commitment from a kid you have actually heard of. But don’t you need to simply focus on where the talent actually resides, instead of chest-bump over getting local kids who will struggle mightily against the USC’s of the world? I guess the key for our WSU perspective is to do what we can in-state, but continue to hit California, harder than ever. I think that is what we generally hear as well, that coach Wulff and company are all over that state. The key is going to be to figure out how to intercept kids from going to the Oregon schools. You talk about their rise coupled with the demise of the Washington schools, it’s not too hard to figure out what has happened. That’s all for now. ENJOY YOUR SUNDAY, and GO COUGS! You are currently browsing the archives for the UW basketball category.